Your body intertwined in blind duet. That helps you find the darkness in the light. A section of the brittle star Ophiocoma wendtii (Photo Credit: Lauren Sumner-Rooney). This is a Heroic Rispetto, inspired by recent research which has found that brittle stars, a relative of sea stars and sea urchins, use thousands of light sensors to navigate their way around coral reefs. The brittle star Ophiocoma wendtii lives in the reefs of the Caribbean Sea, and previous research demonstrated that it has a strong aversion to light despite not having any visible eyes. 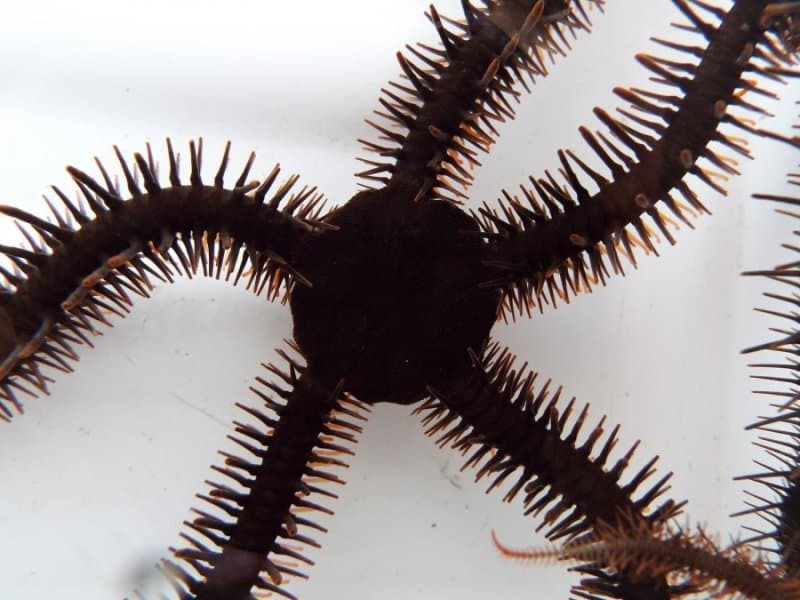 It had also been shown that this species of brittle star rapidly sought out shelter when it was exposed, and that it behaved differently in the day compared to at night. Initially it was thought that the huge number of microscopic crystal bumps that cover the brittle star’s arms acted as micro lenses for an undetected visual system, although this was never proven. This new research used molecular tools to test the brittle stars ‘eyesight’ for the very first time, with researchers identifying light-sensitive cells. It is these light-sensitive cells, nestled between the microscopic crystal bumps, that enable the brittle star to detect visual light, thereby disproving the original lens-based hypothesis. Furthermore, these light-sensitive cells, or photoreceptors, were found to number in their thousands, and are embedded in the skin of the brittle star across its entire body. The researchers also demonstrated that these brittle stars were able to utilize this huge light-sensing network to detect distant patches of shade that could be used to hide from predators. Further research is needed to determine how the brittle stars process all of the visual information that they receive from the photoreceptors in their skin, but it is now clear that these animals can in fact detect visual light, and that they use this to navigate through their environment.